I spent the whole of January slowly decluttering our house. Before, our entry closet was crammed full of Engineer's coats and jackets, tubs of linens, magazine holder after magazine holder of music, as well as surplus musical instruments. That closet is located in our combined living/dining/music room. It stands to reason to have stuff for entertaining or musical items in that closet. You can see in the picture that I have my runners and tablecloths all hanging neatly on hangers. Also in the photo, you can see that red square on the left; that a ziptop bag with red napkins in it. I write on the outside of the bags a description and quantity of each set of napkins. It makes it much easier to make sure none of my napkins were eaten by the drier and also which napkins are in the wash and not available. As for place mat storage, they lie flat upon the shelf so as not to get creased. Napkin rings get stored in ziptop bags as well. Next tablecloth I get will be hung up! 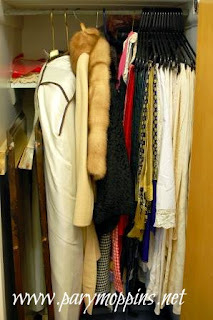 This makes me really miss having a coat closet. We do have a closet next to the front door but it's been turned into a pantry for the kitchen. What a great idea to hang the tablecloths! We use cloth napkins every night but not a tablecloth. I'll have to wait until my kids are old enough to not be tempted to use it as a cape while we are eating. That's a great idea. I can't tell you how much time I've wasted ironing tablecloths! Any suggestions for keeping napkins unwrinkled? ?